Dark Sky started as a Kickstarter project and turned into a gorgeous, functional iOS weather app. Cult of Mac’s Charlie Sorrel praised the app when it launched back in April, and Dark Sky has since seen great success. The key feature of Dark Sky is its ability to quickly tell you when it’s going to storm. In a huge 2.0 update, Dark Sky has gotten even better with several improvements, including the ability to send you a push notification before it starts raining. Dark Sky will let you know that it’s going to pour minutes before it actually happens. No more checking your weather app throughout the day to see if rain is on the horizon. This new beta feature compliments the in-app scrollable forecast timeline beautifully. Push Notifications are a feature that our users have been requesting since we first launched last Spring. 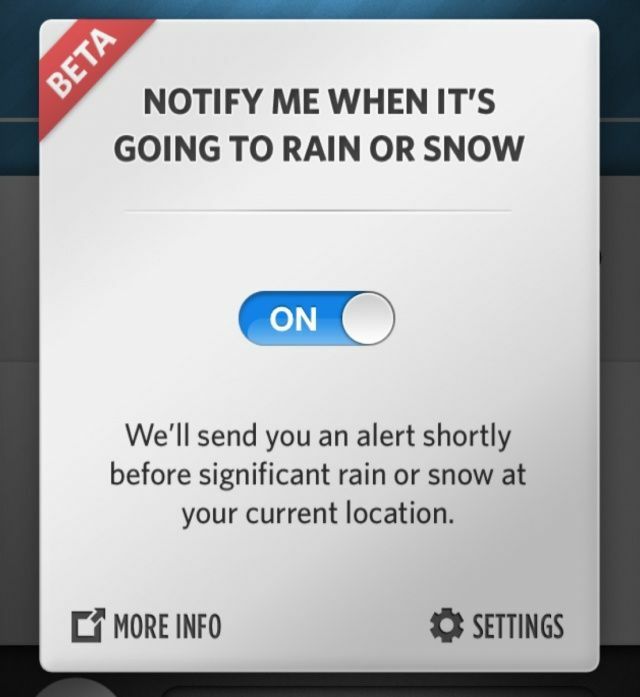 By enabling notifications within the app, we will tell you whenever it’s going to rain in the next ten or fifteen minutes, so you’ll never get caught in the rain — even if you forget to check the app. We’ve actually been working on this feature since the beginning, but it’s been very tricky to implement: we’re not quite 100% confident that we’ve gotten it perfect. For that reason, we’re currently considering the system to be experimental: if you find that notifications aren’t behaving exactly the way you’d expect, we would love to hear from you. As always, we strive to improve the app with every release. The national radar view is a new radar mode that you can access with the touch of a button from the standard radar view. This view is similar to Dark Sky’s existing radar view, but shows the entire continental US at once, so that you can get a sense for the “bigger picture” of what’s happening in the country right now. It has exactly the same smooth, beautiful radar tracking as you’ve come to expect from Dark Sky, on a different scale. And in this mode, you can scroll back in time over twelve hours. Expect notifications to be available in the developer API sometime in the near future. Due to the fragmented nature of international radar data and licensing fees, Dark Sky is not yet available outside of the United States. The developers are, however, working hard to make it happen. A completely revised radar view is also on the way. 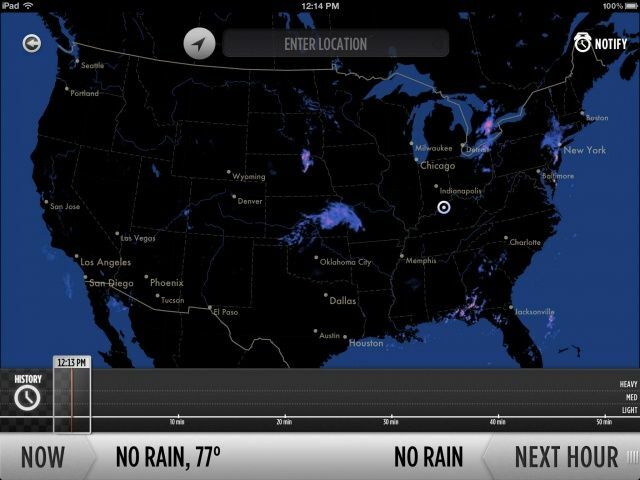 Unlike many weather apps, Dark Sky doesn’t use an iOS device’s GPS to gather location data. Instead, cell tower triangulation is used. This helps conserve battery life. Despite the app’s name, there’s a bright future ahead for Dark Sky and its 35,000+ user base. You can download the universal iOS app for $4 in the App Store.